Out of 32 participants in the MMDA Design Competition for the new MMDA Complex in Ortigas, the number narrowed down to 10. The top 10 were displayed in an exhibit that ran from April 20-24, and were deliberated and finalized on the 25th. 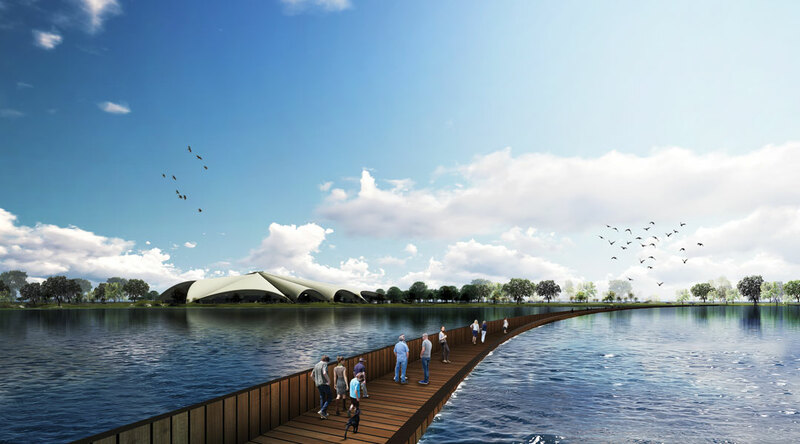 The winning conceptual design was by the lone individual entry, number 2018102, by architect Daryl Van D. Abaygar. Building the concept from the theme, Abaygar created the “Solihiya Moderno.” The design concept emphasizes Filipino imagery and tradition, reimagined and used in a modern setting which the MMDA is moving towards. The design considers the fondness of Filipinos of the shaded outdoor experience that is homey and relaxing. Abaygar creates a gradient between the public and private spaces by making the environs more transparent, spacious, and airy supplemented with green spaces bleeding in between the volumes in the complex. Abaygar adds, “The idea is that this development should be a model of pedestrianized development in Metro Manila. The design entirely seperates the pedestrian and vehicular circulation in such a way that there is a minimal or almost no intersection between these two.” He also hid the vehicular parking space from public view: private parking at the basement and public parking at the back of the retail. A fire lane is also provided around the site for emergency and fire truck accessibility. The grid layout of the proposed MMDA Complex by Abaygar gives the building the advantage of ease in constructibility and manageable structural impacts, and with its separated volumes, the construction can be divided into phases. “These strategies are budget sensitive so that the design can come into fruition,” Abaygar says. Hence, Abaygar also designed areas that are publicly available for use: auditorium, sports center, function rooms, multipurpose-area and learning resource center/library. He also included a retail/commercial building that is placed across the pedestrian crossing connecting it with the city golf retail development in front.